Ever since the conception of the Game & Watch handheld games and the Family Computer (NES), and the birth of Donkey Kong and Mario, Nintendo has slowly but steadily risen to become a household name. These days it is one of the most well-known and valuable brands in the world. For a brand of this stature, a logo is a key asset, allowing products to be recognized instantly. The brand's characteristics and values, developed and earned over the years, are also carried by the brand name and embodied in the logo. Nintendo has used the familiar "racetrack" logo (referring to the line surrounding the name) since the early 1980s, only changing the color every now and then. The typography even dates back to the late 1960s. But Nintendo has not always used this logo. For the first seventy-five years or so since their start in 1889, the logo consisted of the company name in kanji. Up to this day, those kanji are used in Japan as the formal company name, and they continue to appear on their products. But the racetrack logo has replaced these as the main logo used in all marketing communication. During this time Nintendo created a new logo almost every other week, or so it seems. It appears the designers were more concerned if the name style fitted the overall product design, rather than establishing, and sticking to, a constant format. In that sense, these were not brand logos yet. A more stable format was first created around 1965. At this time, Nintendo had started selling a growing range of toys, included some licensed from the American company MB (Milton Bradley). Nintendo drew from (to some extent copied from) the MB style when it developed the grey band on the left-side of the boxes, with the 'Nintendo Game' logo. This logo consists of a circle containing stylized letters 'NG' and the words 'Nintendo Game', in a pinkish red sans-serif font. Examples of games that carry this logo are the Ultra Hand, Captain Ultra Coaster, Picture Cutter and various board games. From the late 60s to the early 70s, the 'NG' circle logo was also used standalone. The somewhat bulging letters, with thin horizontal lines, and the square dot on the 'i'—this design has remained virtually unchanged, even though it is already forty-five years old by now. After it first appeared on the Ultra Machine, this typeface has been used on almost every Nintendo product since. Nintendo continued to experiment with its logo. 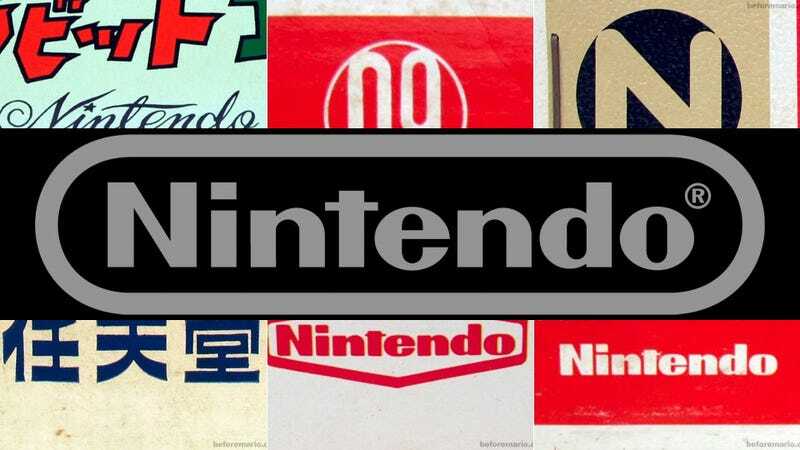 In the early 1970s, the 'NG' logo was replaced by a logo with a stylized 'N', with a black bar containing the Nintendo name in the, by now, familiar font. Before Nintendo settled, at least for a few years, on this new design, a single game (Desert Gunman Game) had shipped in 1972 with yet another stylized 'N' design. At around 1973, Nintendo started using a katakana version of its name (ニンテンドー). This only lasted for a couple of years, after which Nintendo reverted back again to signing their products in Japan with the familiar kanji (任天堂). From that moment on, until this day, the racetrack logo has been Nintendo's constant brand icon. Erik Voskuil blogs on the history of Nintendo BeforeMario, focussing on Nintendo's "toys and games" period (1965-1983). A collector for over 25 years, the items featured on this blog are taken from his personal Nintendo collection, which is one of the most comprehensive in the world. Follow him on Twitter. Read more about Nintendo's Ele-Conga, its Light Telephone, and the company's light-beam games.